Stoneham Theatre In "Perfect Harmony"
Stoneham Theatre will present the New England premiere of "Perfect Harmony" from September 9 - October 3. Conceived / directed by Andrew Grosso and written by Andrew Grosso and The Essentials, the production will settle in to an open ended run Off-Broadway at 45 Bleecker following its Stoneham engagement. "Perfect Harmony" is a comedy about the greatest a cappella group in high school singing history, The Acafellas, seventeen-time national champions. The story also involves their classmates as well as the group's female counterpart (and perennial runners up) The Ladies in Red. The comedy exposes the cut-throat competition of glee clubs and the even more cut-throat competition of high school. Through song and story, these students grapple with the weighty issues of truth, love, what constitutes appropriate choreography for the National Championships, and ultimately, the true nature of harmony. The Stoneham Theatre will include Kelly McCreary, Kate Morgan Chadwick, Faryl Millet, Dana Acheson, Marie-France Arcilla, Clayton Apgar, David Barlow, Jarid Faubel, Kobi Libii, and Robbie Collier Sublett. A variety of Boston-area a cappella groups will present a 20-minute opening act for each of "Perfect Harmony's" 20 performances. 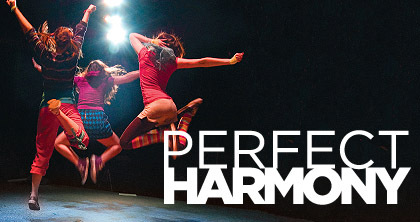 Continuing its trajectory as "the little show that could," "Perfect Harmony" comes to Stoneham Theatre after having been workshopped at NYU’s Tisch Graduate Acting Studio. It subsequently premiered to rave reviews at the 2006 New York International Fringe Festival, with an extended run as part of the 2006 Fringe Encore Series. In 2008, the show moved to NYC's Theatre Row, where it sold out its extended run. Andrew Grosso, who conceived of and is directing the Stoneham production, is the Artistic Director of The Essentials. The show was written by Grosso and developed in collaboration with the previous casts, many of whom created their characters during a series of loose improvisational interview-based workshops. In 2005, the group, now called The Essentials, was given generous support from NYU Graduate Acting’s Studio Tisch Program to finish developing the play. Several cast members from the Theatre Row production will be involved in the Stoneham production. For tickets and information, stop by the Stoneham Theatre box office at 395 Main Street in Stoneham, call 781-279-2200 or visit www.stonehamtheatre.org.